Mountain Pepper, Lemon Myrtle, Wattleseed and Muntries: to name a few. Find out how great these unique plants taste; how they grow and the wide range of uses they have. RIRDC research indicates that many of the species have amazing medicinal (antioxident, anticancer) and nutritional (vitamins) properties (if Blueberries are the benchmark for antioxidents then some native fruits have 30x that amount!) Material will be available from RIRDC and ANFIL. 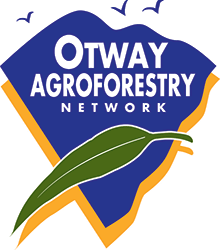 Log-grown SHIITAKE: OAN members, Rob, Matt & Mike from Otway Forest Shiitake, will demonstrate how to inoculate and grow shiitake mushrooms on tree logs. Shiitake mushrooms sell in shops for around $50/kilo and are sought after by fine restaurants in our region. A one-metre long log can produce more than 3 kilograms of mushrooms over the course of 3 years. Logs are inoculated with spawn imported from the USA. The OAN Log-grown Shiitake Growers Manual will be available for sale at the Expo for you to try yourself. Walnuts and Truffles: Chris and Helene Bell and son James from Corunnun will talk about growing Walnuts and Truffles and demonstrate truffle sniffing with their specially trained truffle dog!